I’ve never been a fan of racing games, perhaps because I’ve always found them too restrictive - drive somewhere, race, bash into some walls, collect a reward and hope fixing up the vehicle won’t eat too much into your participation prize. So attending the prestigious McLaren Technology Centre to get some hands-on time with Forza Horizon 4 was potentially lost on me - or at least I thought it would be. The McLaren Senna is the cover car for the latest addition to the Forza Horizon franchise, the Bond girl of the racing world - slick, curvy and a bit fiery - so holding a preview event in the epicenter of one of Formula One’s titan teams seems fitting. We’re treated to a tour of the mysterious facility, immaculately clean, minimalist and lined with stunning vehicles - time capsules of races past. I can see why this is a vital part of the preview, I’m being engrossed in the world of unobtainable supercars and speed - and I want to get behind the wheel. Forza Horizon 4 is due for release just next month, but developer Playground Games is hard at work tweaking and polishing, so the version we played was near final code but not quite. The premise of Forza is that you are an up-and-coming driver attending the Horizon racing festival in a compact version of Britain. The most captivating feature straight-off-the-bat is the visuals, as arguably no game (apart from critically-acclaimed Everybody’s Gone to the Rapture) has captured the sheer beauty of Britain in such a realistic way. However, Playground Studios boss Ralph Fulton wasn’t initially convinced it was possible - even if the game’s development gave him a new found appreciation for Britain. It was the introduction of seasons which ultimately sold the team on their homeland as the location. “It felt like these two things went together and supercharged each other,” Fulton explains. The prologue walks (or should it be drives?) you through your first year at the Horizon festival, introducing the festival itself, alongside the brand new dynamic weather system, which sees each of the four seasons having its own specific weather, impacting the driving conditions - heavy autumn rain means aquaplaning and winter ice means poor control. In summer, I found myself easily navigating the potholes and tight bends of the British countryside - having time to take in the atmosphere and ultimately winning more races. However, spring showers and icy roads saw me skidding off roads and into fields, not unlike my real-life driving experiences. Luckily, damage is cosmetic only unless you manually change the settings. According to Playground, once you’ve progressed passed the Horizon Life point in the game, the seasons each last one real-world week, creating an extra challenge for players. However, this can be managed through fine-tuning which allows you to adjust air pressure, gearing, alignment etc. Luckily the rewind feature was a saving grace, allowing me to backtrack to a point before crashing into a wall and rethink my speed and handling. Although it seems like something which could be reduced to a “simple fix”, I found using rewind to be a serious learning curve, which hammered in the importance of breaking early, reducing speed for corners and trading speed for control. This is what is at the heart of the Forza Horizon series as a whole - it’s meant to be enjoyable. It’s a prime reason for the games being open-world rather than the traditional linear setting leveraged by racing game developers. 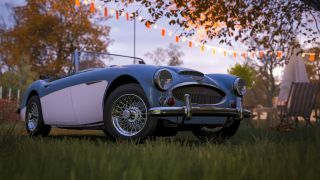 It’s this open world which gives the game more breathing space, allowing you to steer away from the main storyline to take part in activities like stunt driving, dirt racing and street races to gain influence and qualify for higher profile races - or simply take in the breathtaking sights such as wheat fields, windmills and old English cottages. If you need a bit of extra guidance, then your AI Anna is essentially your personal Sat Nav. Playground Games announced earlier this year that it was doing away with microtransactions and loot boxes in the Forza Horizon series after listening to community feedback. “Our first consideration was let's make sure our game's economy and progression is fair, balanced and - crucially - it's rewarding,” Fulton explains. “The microtransactions we had in Horizon previously have been peripheral, if you want to accelerate towards owning that car then you can pay some real money. Red flags sprung up when I spotted certain in-game cosmetics could only be unlocked by using a ‘Wheel Spin’ feature in Forza Horizon 4. However, Fulton assured me these spins can not be paid for with real-life money. “It's just through progress,” he explains. “You can get wheel spins if you level up a particular thread or your level. There are a tonne of ways to get them but you can't pay for them." This is the same case for Forza’s Fortnite-style emotes which include popular dances like ‘The Carlton’, flossing, the YMCA and the moonwalk - used for showing off after a win. Perhaps what is most obvious from talking to Ralph Fulton and getting hands on with Forza Horizon 4 is how much the team has taken community feedback onboard. When Forza Horizon 3 launched on PC, there were a myriad of performance issues which resulted in frustrated fans. “For recommended spec we're targeting 60 fps, rather than 30fps - which is what we did last time. It's an important yet subtle change, Fulton explains. “I think releasing on PC was a learning experience for us. Forza Horizon 4 releases for Xbox One and PC on October 2.